VATICAN CITY (CNS) — Watch out for the tempting promises and easy rewards of false gods and idols because they always lead to confusion, disappointment and even death, Pope Francis said. “We are tempted to seek even fleeting comfort, which seems to fill the emptiness of solitude and ease the exertion of believing” in God, especially in times of trouble, he said Jan. 11 during his weekly general audience. But the hope and security that come from God “never ever disappoint,” he said. “Idols always let you down” since they are figments of the imagination and not “alive and real” like God. The pope continued his series of talks on Christian hope by reflecting on Psalm 115, which warns of the false hopes and securities offered by man-made idols. Even things like physical beauty and health become idols when a person is willing “to sacrifice everything” in order to obtain or maintain them, he said. “They are all things that confuse the heart and mind and instead of promoting life, they lead to death,” he said. As an example of this, he said he once heard a woman speak very nonchalantly about procuring an abortion because the pregnancy would have ruined her figure. “These are idols and they take you down the wrong path. They do not give you happiness,” he said. 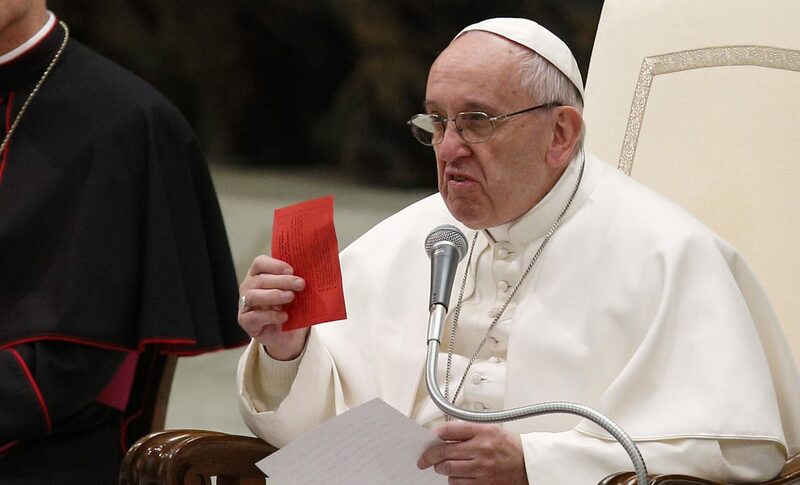 The pope marveled at the huge number of fortunetellers he used to see sitting in a city park in Buenos Aires, Argentina, and the lines of people waiting their turn to consult them. The shtick “is always the same, ‘There is a woman in your life,’ ‘Something dark is coming,'” he said ominously. But the people would pay to hear such things, and this was supposed to make them feel better even though they were putting their trust in a bunch of nonsense, he said. “Even we, people of the church, run this risk” of becoming worldly, he said. “We need to be in the world, but defend ourselves from the illusions” and idols of the world. “In this God, we have hope. This is the God that is not an idol, that never disappoints,” and always remembers his people even during their most difficult trials, he said. “I found out that there are pretty crafty (people) who charge for tickets,” which should have written on them in different languages that they are completely free of charge. “Whoever makes you pay to get you into an audience commits a crime,” he said. Tickets for papal Masses also always are free. No tickets are needed for the noon Angelus prayer.